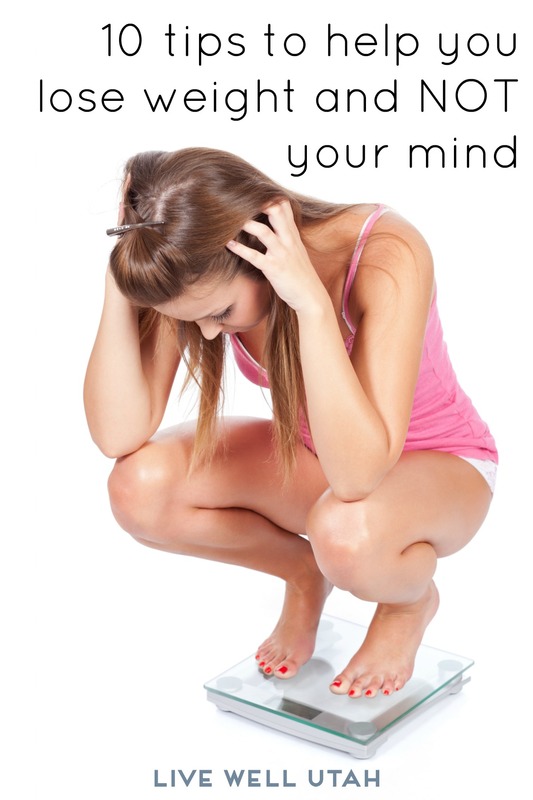 Does the thought of losing weight make you feel like you’re going to lose your mind? Here are 10 tips to help. Eat appropriate portions. Our society suffers from “portion distortion” and “biggie sizing” many things. By eating the right amounts and not over-eating, you can maintain a healthier weight. Larger plate sizes also tend to encourage overeating, so watch your plate size. Don’t skip meals. Skipping meals causes the body to think it is in starvation mode and it actually tries to store food in the form of fat on the body. Smaller meals and healthy snacks throughout the day can help you lose weight or help maintain the proper weight. Don’t cut out a food group. All food groups (even sweets) have a purpose in your diet in helping maintain the proper weight. Cutting out a food or food group (unless you have allergies or other health concerns) can cause you to be less healthy, or even heavier, and possibly not able to lose weight. Choosing foods with healthy fats (mono- and polyunsaturated and Omega-3 fatty acids) are important to body functions rather than unhealthy fats (saturated and trans-fats), which can increase health risks. Focus on what you can have rather than what you can’t have. Follow the new dietary guidelines by increasing fruits and vegetables to fill half of your plate at mealtime. Include whole grains (half of 6 oz. should be whole grains), lean protein (5.5 oz.) and don’t forget the dairy each day. For more information, visit http://choosemyplate.gov. It is okay to occasionally have sweets. Eating a small portion of dessert rather than none at all will likely keep you from eating the whole pie later. Reduce stress and don’t become sleep deprived. Studies show that stress and tiredness can cause unhealthiness and weight gain. Also, being in a hurry while eating can make you not feel full when you really are. Slow down and savor your food. Avoid drastic changes that will cause the yo-yo effect. Small changes over a lifetime are more effective than trying to do it all at once. Fad diets also have a tendency to cause weight gain later, and you can end up having more weight to lose than when you started. Notice how you’re feeling when you eat. Emotions can contribute to overeating as well. Lose fat, not muscle. Gradual weight loss of 1 to 2 pounds per week, eating right and increasing activity levels will help. Remember that muscle is leaner than fat, so when exercising, you may be trimming down and losing fat but still may weigh the same because you are gaining muscle. Drink plenty of water. Water helps curb the appetite and sometimes when you think you are hungry, you are actually thirsty. When you feel thirsty, you are probably already dehydrated. If you don’t like tap water, try drinking filtered or bottled water. Visit http://choosemyplate.gov for more information. The site includes information on weight management, daily food plans, SuperTracker, tips, resources and more. One of the main reasons for not meeting goals is not having a doable plan. 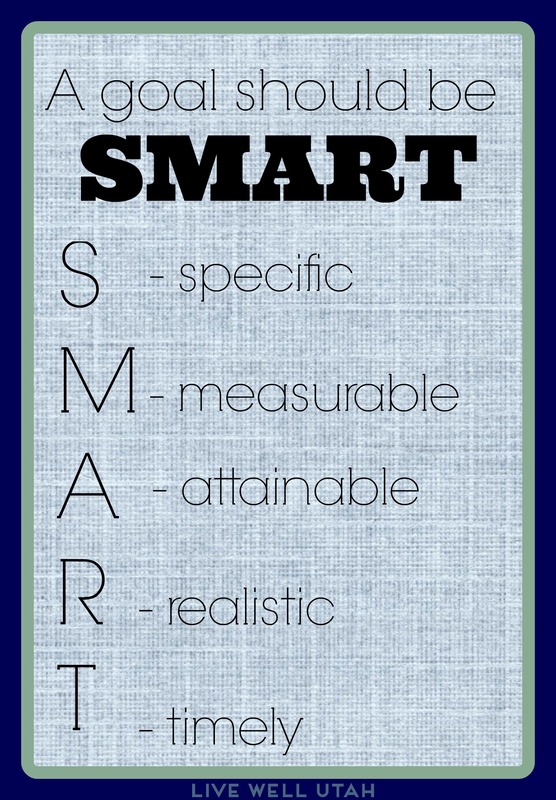 A goal should be SMART — specific, measurable, attainable, realistic and timely with a plan to achieve it. Consider these ideas when setting weight loss goals. What’s one of your go-to tips for losing weight and keeping your sanity? 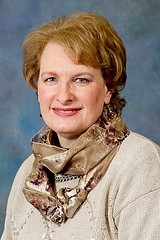 Author bio : SuzAnne Jorgensen works with adult and youth groups and individuals to educate them in the areas of canning, food safety, nutrition, finances, small business and many other topics related to home, family and business through Utah State University Extension in Garfield County. Yes, we should drink a lot of water. Great article SuzAnne, keep writing.